Holidays, holidays. The silly season is here and Thanksgiving kicks off the special time of year when families congregate from far and wide at a dinner table to give their thanks. Thanks for their health, thanks for prosperity, thanks for incandescent lighting… everyone has something to be thankful for – usually. Unfortunately, this year’s election may make tabletop conversation even more bellicose in some households, so you may be wondering how to diffuse the bombshells before they drop in on dessert. In the sardonic confines of my own dining room, I would consider aiming a sodium thiopental blow-dart at someone’s neck, but in more conventional households, drugging family members might be frowned upon. In those cases, I recommend something far less egregious: Tryptophan. Tryptophan might sound like an espionage-level tranquilizer, and you would be partially right, but it’s actually a very natural amino acid that’s already present in many foods we eat every day. I say you would be partially right, because even though tryptophan doesn’t have any knock out effects on its own, it contains the biochemicals your brain uses to create serotonin, which de-agitates and sedates an anxious soul – no dart gun required. Serotonin is your brain’s natural mood enhancer, and there are a few theories that correlate imbalanced serotonin levels with depression, but if a nap is what you’re looking for, it also metabolizes into melatonin, which triggers your sleep cycle. Basically, tryptophan is the delivery system for an effective one-two punch that can knock out the grumpiest Gus at your table. So what sort of Thanksgiving fare should you serve up for a positive food “tryp”? Well, turkey is definitely a good place to start, but there are plenty of other foods that are also high in tryptophan. A cup of pumpkin or squash seeds contain over 250% of your recommended daily intake (RDI) of tryptophan and they make a fantastic garnish for salads and muffins. Cheese goes with just about anything, and a cup of mozzarella or cheddar also has well over 250% RDI of tryptophan, so reach for the mac and cheese if you can. Tofu and edamame are among many soybean dishes that are trypto-loaded with just under 200% RDI per cup, and they make a great exotic snack for less traditional dinners. Spirulina is a dried algae powder that’s popular among vegans and health food enthusiasts, but it’s also a superfood that’s high in protein, vitamins, minerals, and… tryptophan. It has a whopping 370% RDI per cup! Chicken, beef, and pork also hover in the same range as turkey (around 200-250% RDI), so they substitute well for anti-turkey families, but then, why is turkey the trypto-target for Thanksgiving naptime? The answer might not be in the main course, but rather, your side dishes. I’m not one to judge on dinnertime preference, but if you want a sharp quick trip to dreamland, drop the cauliflower and load up on the starchy stuff along with your turkey, because carbs are your ticket. 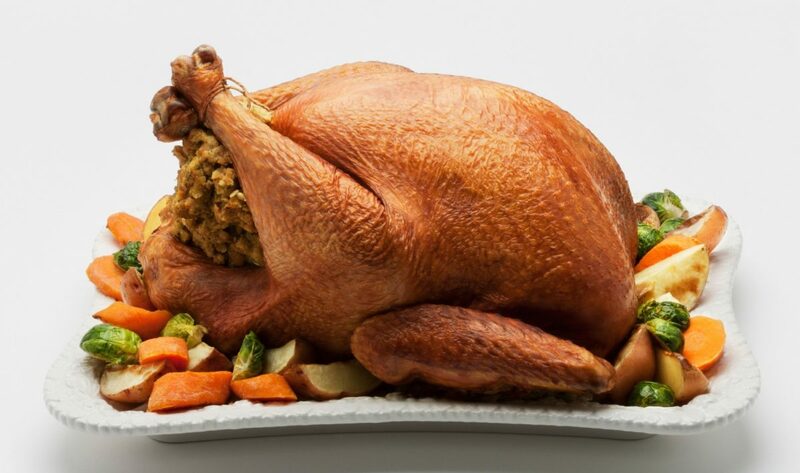 While the tryptophan in turkey will definitely help you pass out, it’s actually the tons of stuffing, potatoes, and other carbs that let your body process the tryptophan and put you in a carbo-coma. Compared to other molecules, tryptophan is actually quite large, and like all big things, it doesn’t move around very well, so it has difficulty competing with other amino acids for absorption. Basically, it wants to push its way to your brain where it can do its job, but all the other amino acids floating around will get in its way like teenagers at a Justin Bieber show. When you chase a mouthful of turkey with a mouthful of stuffing, your body releases insulin to process all the sugars in the carbohydrates, but the insulin also triggers the absorption of amino acids. Most amino acids belong in your muscles, but not tryptophan. It heads straight for your brain, and while all the other amino acids are out of the way, its bulky self has a free and clear path to do its job building serotonin and melatonin. Tryptophan isn’t a magic cure-all by any means, but it’s been used to treat sleep disorders, mood disorders, headaches, and even eating disorders, among other things. You just need it to keep the peace during your holiday dinner, so if someone asks for second or third helpings, let them go ahead and grab the last turkey leg. Competition won’t be too fierce in them after a heaping plate or two, and that leaves you open for just desserts.